Our 4th annual sale of aviation collectables in Co-operation with our sister auction house Marlows of Stafford, proved our most successful to date and it seemed appropriate that as the RAF celebrates it’s 100th birthday the sale included a large number of items representing the Royal Flying Corps, Royal Naval Air Service and the infancy of the Royal Air Force. A good representation of this was the uniforms of Observer Lieutenant Anthony Joseph Hill Thornton a confirmed Air Gunner Ace with five kills to is credit. 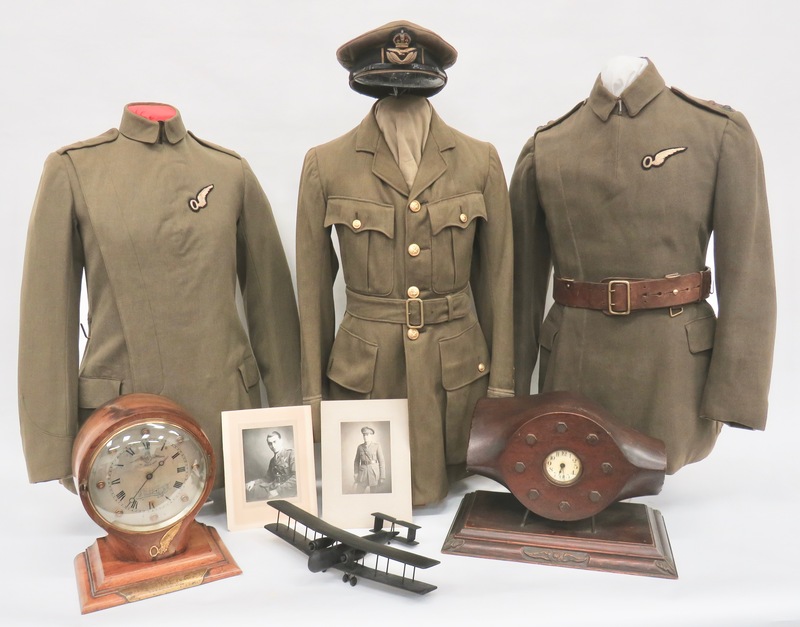 His first “maternity” pattern RFC tunic sold for £2,400, his second £2,200, his tunic representing the first pattern Khaki RAF sold for £840 and his 1918 RAF cap selling for a record £1,900. The ephemera section saw a Great War log book and ephemera to an Officer who flew with 6 Squadron in France selling for £550. Within the medal section another Observer Officer was represented, Lieutenant Archibald Touse Streeter who had flown operationally with the BEF with 82 Squadron. This Squadron flew the large FK8 aircraft and on the 2nd September 1918, following a bombing raid, his aircraft crashed on return, the ground crew crafted a very fine propeller boss clock, engraved to the silver face with the doomed aircraft. What made this a fascinating grouping was the amount of original material including medals, log book, photographs, badges etc, enabling it to sell for £2,000. Inter war flying saw a rare attributed R101 airship crewman badge selling for £1,000 and a group of 1920’s Royal Canadian Air Force badges selling for £600. 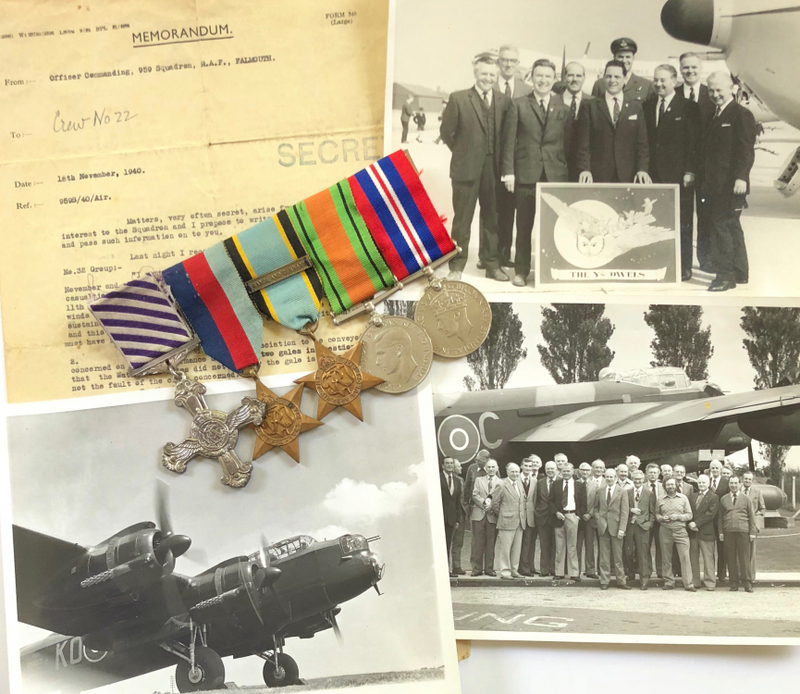 Aviation collectors of WW2 had an opportunity to bid on a very fine Bomber Command DFC group of medals which sold for £1,900 and an emotive RAF Far East Fighter Pilot group awarded to Flying Officer Jack Miller who was killed on his first combat sortie sold for £260. Military aviation was not the only items offered in this sale but scattered throughout was a quantity of civil items including a 1960’s official model of a BOAC Britannia Turbo prop airliner contained in original posting box sold for £300. A large section of the sale was devoted to a collection of RAF aircraft recognition models, these were acquired by the vendor after the closer of RAF Church Fenton in 2013. Representing some of the rarest aircraft to have flown during WW2 and later. Intense internet and room bidding saw £260 paid for a Horsa glider in its original War Economy box and £280 was paid for an impressive example of the Short Mayo Combination Flying Boat. This part of the sale concluded with WW2 Escape Items, which included a Royal Canadian Air Force Escape button selling for £420 and a scarce pattern of silk escape map and original packet attributed to Leonard Joseph Sumpter DFC.,DFM who was bomb aimer to David Shannon on the 617 Special Duties Squadron “Dambuster” raid. Acquired by the vendor’s wife who worked with Mrs Sumpter in the late 1970’s, it sold for £850. Already consignments are arriving for our 5th Annual Aviation Collectors sale which is scheduled for September 2019.